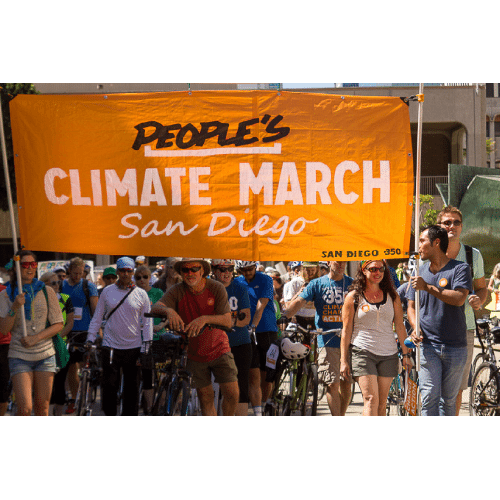 People's Climate March, A Peaceful Demonstration For Our Earth. Thousands Of Concerned People Came Out To Express Their Concern For Climate Changes And Their Effects On Our Environment.A very large group of people came out in force to express their concern for the planet and to present ways to help. The signs the Marchers held expressed sadness, anger, hope and demands for resolution to the effects of Climate Change. The enthusiasm of the crowd was contagious and all were focused on the issue. The joint energy carried through the March and spread to the people on the sidelines offering support and voice to the protests. There were numerous organizations and companies who offered information and ideas and services to help mediate Climate Change and improve the environment in general. Some of those present were providing information about water wastage, sustainable gardens and energy sources, alternative energy, solar, saving animals and the environment, eliminating carbon footprint, no waste San Diego, composting, recycling and reuse, and repair and many more. There were many speakers and presenters, and performances, by a choir, music by a DJ, even a Dance by the Barona Tribe of the Kumyaay Nation to save the earth, There are links to other articles and information below. It was a wonderful outpouring by residents of San Diego County and a wonderful March for our earth!